NHS Highland officials came under scrutiny from the Audit Committee of the Scottish government in 2015. (L-R) Chris Brown, Nick Kenton, former chairman of NHS Highland Garry Coutts and Elaine Mead, Chief Executive of NHS Highland. Picture by Sandy McCook. Health chiefs in the Highlands have been ordered to carry out a major review after investigators found they were paying a £200,000 contract that was not legally agreed. It has been revealed that a probe ordered by the powerful Audit Scotland watchdog uncovered that NHS Highland had demonstrated a “lack of formality and understanding of the importance of good contract management”. The health board, which is currently seeking a £15million bailout from the Scottish Government to plug a massive budget overspend, faced accusations that it “can not always demonstrate the achievement of value for money”. And auditors told the local NHS service to order a “review of all contract arrangements” and “reconsider how they engage with all GP practices” across the region because of the “risk” that the problems could be widespread. 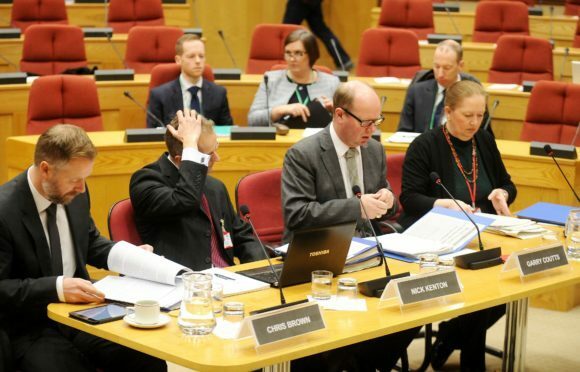 The probe, revealed by the Scottish Conservatives just weeks after NHS Tayside was plunged into turmoil amid accusations of financial mismanagement, focused on two contracts at the health board. The board’s external auditors, Grant Thornton UK LLP, found that an agreement to provide intermediate care at the Nairn medical centre had been in place since 1998 but had not been subject to a formal tender or “value for money” assessment. According to the report, the contract, which is now worth about £200,000 a year, was terminated by the board in May 2016 for “unclear” reasons, but it was then reinstated following a complaint by the practice. And when the terms of a new intermediate care contract was agreed between the board and the Nairn centre in September 2016, money was paid to the facility from that date despite the deal not being officially signed off until February 2017 – meaning NHS Highland was paying for a service that was not legally agreed. The health board, which has accepted the report’s 14-point action plan and vowed to tighten up its procedures, insisted that the agreement had not been terminated at any point, and that payments between September 2016 and February 2017 were made under the legally-binding terms of the pre-existing contract. But Edward Mountain, the Scottish Conservative MSP for the Highlands and Islands, branded the findings “murky”. “This report, which only looked at two instances, makes plain that this mismanagement could be even more widespread. That raises questions about this sort of practice right across Scotland,” he said. “There is no analysis of value for money, quality of care or patient satisfaction. With budgets as tight as they are, this is completely irresponsible. A second contract examined by the auditors covered vasectomy services in the Highlands, with a rising numbers of procedures prompting a call for a review to ensure the “cost per case” calculations remain valid, and that the objective of freeing up space in Raigmore Hospital was being met. NHS Highland’s responses to the 14 recommendations are published in the report, with most of the changes currently being implemented. A Scottish Government spokesman said: “It is important that all health boards follow the relevant procurement guidelines to ensure the best use of resources. The report was produced after correspondence submitted to Audit Scotland raised concerns about NHS Highland’s contract management and procurement service. The watchdog asked the health board’s external auditor, Grant Thornton UK LLP, to further investigate two contracts covering region-wide vasectomy services and intermediate care in Nairn. After the probe, the auditors produced a report in December last year which outlined “a number of actions where the controls in place need strengthened, particularly in relation to the ongoing contract performance monitoring” in areas where there was a “lack of formality and understanding of the importance of good contract management”. Recommendations were made after it was found that the contract to provide intermediate care at the Nairn medical centre had been in place since 1998 but had not been subject to a formal tender or “value for money” assessment. The contract, which is now worth about £200,000 a year, was terminated by the board in May 2016 for “unclear” reasons, but it was then reinstated following a complaint by the practice. A new intermediate care contract was then agreed between the board and the Nairn centre in September 2016, and money was paid to the Nairn facility from then despite the deal not being officially signed off until February 2017 – meaning NHS Highland was paying for a service that was not legally agreed. The health board said the payments were made under the terms of the pre-existing contract, and that the agreement was not terminated in May 2016, only that a “notice of termination was given and then revoked”. A non-executive member of the NHS Highland board was also a GP in Nairn at the time, but not involved in the contracts. Meanwhile, the auditors found that the number of vasectomy procedures were increasing in the Highlands so the health board should review whether the current arrangements still represented value for money. The report added that there was a “lack of clarity” at the board over what was a contract and what was a service-level agreement, and that it was “not currently the case” that contract monitoring arrangements were being carried out on a consistent basis. And it urged NHS Highland to routinely report tender waivers to its audit committee, including providing a “clear rationale” for any waiver, after a look at three examples found that in two of the cases there was no evidence in the documents to validate value for money, and no mention of contract performance to support the decision.